I have heard of AÑEJO for some time now but was wary on trying out this place as there seemed to have been mixed reviews. 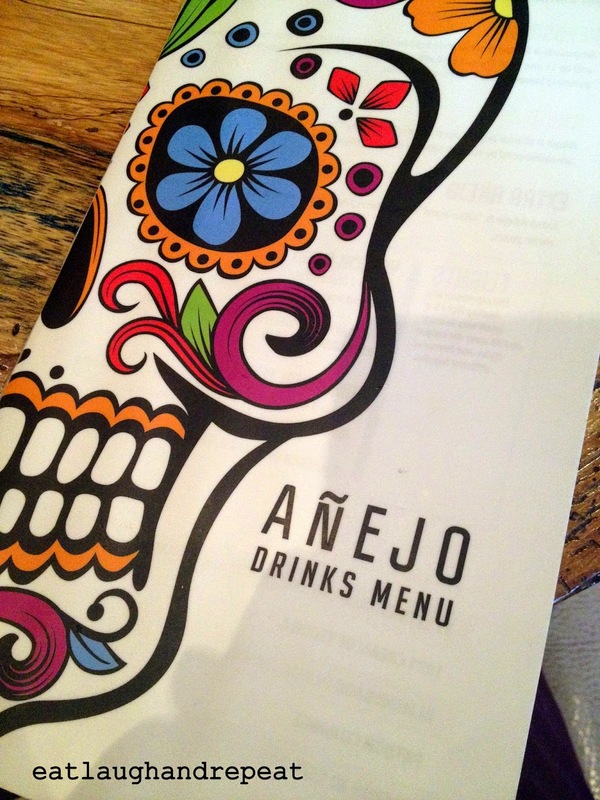 I got a "taste test" from AÑEJO when I paid my first visit during the 2013 Poutine Crawl. I loved how the restaurant was designed, with its high windowed ceiling and how open the restaurant looked. I decided to go with a girlfriend of mine to catch up a couple of weeks ago on a Friday night. My friend had arrived early and was put on a wait list that would require a wait of approximately ~45 minutes. I was rushing to meet up with my friend ASAP when she told me she was early, but the wait ended up being shorter than what she was told and she had gotten a table before I had arrived. When I got there, the entire restaurant was bustling and busy. All the tables were filled up and people were everywhere. It was hard to believe that such a tiny restaurant could be so filled up. We quickly got down to business and scanned the menu together, discussing what dishes caught our attention. There were so many items on the menu that we wanted to try, but we were both not feeling all too hungry together, so we knew we had a limit on the number of dishes that we could order. We decided to order a few things to share. First off was their famous guacamole that everyone seems to order when they go. It came with 1.5 avocados, onions, cilantro, tomatoes, habanero sauce, and jalapeno. This dish came with all the ingredients unmixed in a large molcajete, a traditional Mexican stone tool (similar to the mortar and pestle). After being brought to the table, they mix the ingredients together in front of you as part of a mini show. As soon as all the ingredients were mixed together, my friend and I both agreed that we were able smell how fresh the ingredients were and instantly, our appetites were stirred and we were craving to taste some of the just made guacamole. The next dish to arrive was the Tuna Tartare. The tuna pieces were fresh and each piece was satisfying because it was so large in size. Included with the tuna were cucumber, capers, cilantro all seasoned with a hint of lime and placed upon a watermelon. All my friends and family know that I have a thing for watermelon. It's my utmost favourite fruit, but I was turned off from this watermelon because it was soaked in tequila. This has made me realize that I am not a fan of mixing fruits and alcohol together. But if you're a tequila enthusiast, then you'll probably enjoy this watermelon-soaked-tequila more than I did. On top, two large pieces of corn tostadas accompanied this dish. I only wish there were a few more tostadas to better even out the number of tuna pieces there were available. Last but not least, we had the Molcajete with Meat because we felt we were missing some meat in our meal. This dish had chorizo, chicken, beef tenderloin, red peppers, onions, cilantro, asparagus, all placed upon a cactus. It was definitely an heavier dish in comparison to the other plates we ordered. It was my first time eating a cooked cactus, and I must admit that it was nothing too out of the ordinary taste wise but it was for sure more chewy and tough than other greens. Alongside the meat molcajete were some heated up tortillas that were delivered in a microwavable flat tote. I was not impressed by this because I felt like it was somewhat unsanitary, since it seems like it could be reused from table to table without being washed. And with a saucy molcajete like ours, the tote was bound to be inflicted with sauce at some point or another. Overall, AÑEJO's food was decent but nothing I'd crave to go back to again. My favourite dish was probably the guacamole, it was simple and healthy, a perfect dish that would help fulfill my constant need to nibble and munch on something. It is a very lively restaurant, perfect for a Friday's night out if you're looking for a chill and casual place that has a energetic atmosphere. It was probably not the best place for my friend and I who wanted to catch up after not having seen each other for three months. As we were finishing up, the restaurant dimmed the lights and a projector screen was loaded onto its wall with animated Mexican motion pictures.